Avernum: Escape From the Pit is a remake of Avernum (1999), which itself is a remake of Exile: Escape From the Pit (1995), Spiderweb Software’s very first RPG. Built on their latest game engine, Avernum: EFTP retains the original’s storyline and environments, but revamps the graphics, interface, and certain game systems. On top of that, it adds some new characters and areas to explore. The game is available for Mac, Windows, and iPad. All five games in Spiderweb Software‘s Geneforge saga are now available on Steam as a $20 bundle (currently on sale for $15). The series takes place in an original fantasy world dominated by Shapers, powerful mages who can create life from scratch. 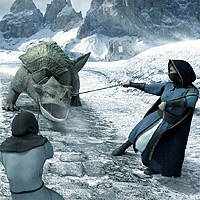 Like many of Spiderweb’s RPGs, the Geneforge games are known for their deep storylines, flexible skill system, and tactical, turn-based combat. The first game was released in 2001 and the final game was released in 2008. Spiderweb Software’s latest RPG has just been released for Windows. Demos for both the Mac and PC versions are available for download here. 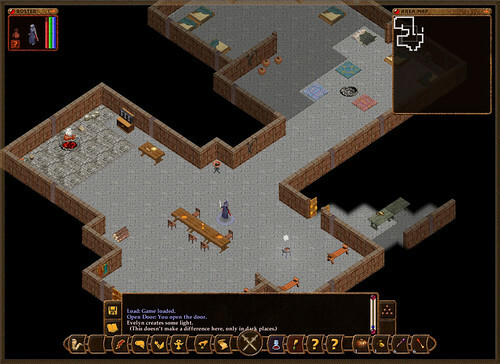 Avadon: The Black Fortress marks the inception of not only a new series of isometric CRPGs for Spiderweb Software (the previous two, Geneforge and Avernum, spanned 5 and 6 games, respectively), but also a new engine and artist. In Avadon, you play as a servant of the black keep, trying to unravel a conspiracy to destroy your people. The game features four character classes and multiple endings. Like all Spiderweb games, Avadon has been released for Mac first, with a Windows version to follow in the next few months. The full version is $25, but there’s a demo of the game available to try out. For Book II we’re sticking with the same old-school design principles and focusing on gameplay improvements and elements that were left out of Book I. We’re taking 99% of the improvements from fan suggestions such as increasing the game’s resolution, improving the interface, adding female characters, weather effects that influence stats, powder kegs that can be moved around, improved dialog and quest options, and much more. Some of the 60 improvements are less tangible, such as engine tweaks to allow the game to consume fewer resources than Book I and run smoother, but they all lead to a better gaming experience. Eschalon: Book II can be purchased for $24.95 and Book I, which was released in 2007, now costs $19.95. Demos are available for both games. Also, I noticed that Spiderweb Software’s long-running RPG series, Avernum, has finally reached its conclusion this year, with Avernum 6. Like Eschalon, the last game in the series came out three years ago, in 2007. The game is available for both Windows and Macintosh. So yeah, so far it’s been a good year for fans of old-school, story-driven indie fantasy CRPGs! For more indie RPG love, you should check out Craig Stern’s IndieRPGs.com. Craig is a developer of RPGs himself, having created a number of games under the label Sinister Design. The Exile games are RPGs in the Ultima style: make a party, crawl through an enormous world, gain stats, talk with people, kill thousands of monsters, and so on. Very addictive. 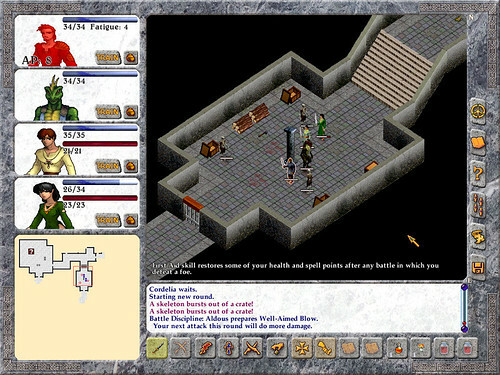 They were later remade as the Avernum series, although some don’t like the remade games as much as the original ones (especially the remade graphics perspective). My absolute favorite part of the game is how detailed the world is, how each NPC has custom text and feels like a real person, with their own lives and backgrounds. The story is written in third person, like a fantasy novel, which is odd for a game but works well here. Jeff Vogel released the first Exile game back in 1995, making him one of the most classic indie developers still actively making games (he’s still releasing new ones, Geneforge 5 is the latest). The original shareware Exile trilogy was released between ’95 and ’97, and the free and open source Blades of Exile game (where users can create their own campaigns) was also released in ’97. Of the original three, the first one is a bit dated, so I actually recommend beginning with the second or third one, or with the free Blades of Exile, since the GUI and so on are much improved on over the first one. For instance, to ask a character about a specific thing involves clicking on a word in the second and third game, but manually typing that word out in the first game. Even the demos of the shareware ones are quite lengthy, and offer at least 10-20 hours of gameplay each. These were some of the first indie games I ever played, they existed before the term ‘indie game’ was even commonly in use. One of my fondest game-related memories is, back on Windows 3.1, noticing that the graphics to Exile 2 and 3 were stored in simple .bmp format, and going into MS Paint and manually editing the appearance of a few of the character sprites, customizing them for my characters, such as replacing a staff with a sword, or recoloring red clothes to blue. Spiderweb Software has just released Geneforge 5: Overthrow, the final chapter of their Geneforge RPG series, for the Macintosh. The Geneforge games center around mages called “Shapers,” who can create monsters and servants to do their bidding. I don’t have much experience with the series, but the games are well-regarded for their intricate plots and open-ended gameplay. 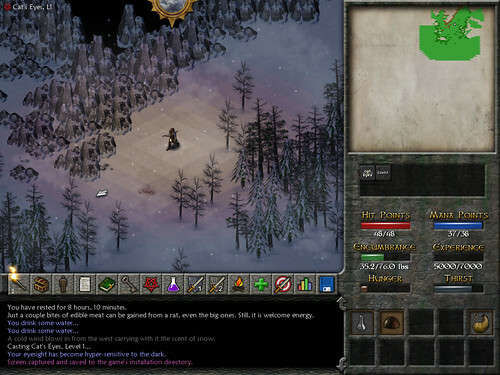 It’s definitely worth checking out for fans of old-school CRPGs. The full version of the game is $28. A Windows port is slated for March 2009. Jeff Vogel and Spiderweb Software have been going strong for over a decade now, having released well over a dozen full-length shareware RPGs for Windows and Macintosh since 1994. It’s been a bit of a wait, but I’m happy to announce that his latest game, Avernum 5, has finally been released for both platforms (including demos)! Spiderweb games have never much been known for their presentation, so Avernum 5’s graphics haven’t progressed all that much since the last game… or even the original game. But that’s never been a problem for its fans, who enjoy the intricate plots and unique, sprawling worlds. For RPG fans, I think its definitely worth checking out one of the mainstays of the genre.